UPDATED, March 30, 2011 — Omar Gude Pérez was released from prison in February 2011. A version of this post was published here earlier. In Cuba, the repression of basic human rights is absolute. There is no leniency, and even the truly "innocent" — like the children of political prisoners — are not immune from the Castro dictatorship's reach. Usually, I write about prisoners and other dissidents who have been punished for taking political or societal positions against those advocated — or better put, enforced — by the government and communist party. 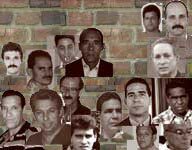 But in the Castro gulag, there some political prisoners, like Omar Gude Pérez, who are imprisoned not because they have actively taken a stand contrary to the dictatorship's, but because they have chosen to live by their conscience and their faith in God, and nothing less. They have chosen to live as truly free men, which is probably the greatest affront a Cuban can commit against the regime. Gude, a leader of a non-denominational Christian group called the Apostolic Reformation, last year was sentenced to 6 years and 7 months in prison on a charge of "falsification of documents and illicit economic activities." The dictatorship had settled that as his "crime" after an earlier charge of "human trafficking" was dismissed. Whatever the "charge," it was just an excuse utilized by the dictatorship to move against a religious leader who had chosen to live and preach not as part of an officially recognized religious organization. The U.S. State Department earlier this year cited Gude's case as an example of increase religious repression on the island. Numerous other dissidents, from Darsi Ferrer Ramírez to Dania Virgen García, have recently fallen victim to similarly thuggish tactics — the criminalization of dissent — by a regime too afraid to admit that it is only trying to silence and punish those Cubans who reject it. It is not enough that Gude has been unjustly imprisoned. To up his suffering, the dictatorship has now targeted his wife Kenia and his young children, earlier this month evicting them from their house and forcing them to move into a smaller apartment in Camagüey. Absolute and without leniency, that is the Castro dictatorship. The official reason for the eviction is that the family home is considered the result of "illicit gain," but the authorities have repeatedly told Kenia she is being punished because of efforts to inform foreign governments and non-governmental organizations about her family's plight, according to a news release from Christian Solidarity Worldwide, which has taken a leading role in advocating for Pastor Gude and his family. * Photo courtesy of Christian Solidarity Worldwide.